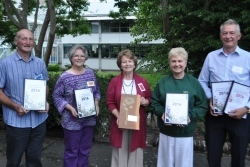 Towns and villages across the Borders rose to the occasion for the 17th Floral Gateway Awards. This year’s winners and runners-up were celebrated at a ceremony at our Headquarters in Newtown St Boswells on Tuesday 6 September, with Peebles named overall Champion of Champions. The four joint winners of the Clean and Tidy Award each receive a new waste bin for their communities, while the two Quality of Life winners will receive a new bench. “The Floral Gateway Awards aim to recognise the huge amount of work which goes in across the Borders by teams of volunteers, and I am delighted that communities have also embraced the new awards we introduced last year. "Well done to all participants but particularly the hard working team at Peebles who thoroughly deserved the Champion of Champions award. More information is available at our Floral Gateway page.